Having a great rewards credit card can definitely be a good thing. If you pay it off immediately so as not to accrue interest then you’re basically getting free money for the money that you already spend anyway. However you have to make a smart choice so that you get the right rewards credit card. Those card companies are tricky, too; they include a lot of fine print that waters down the rewards that you believe yourself to be getting. Limits on big cash back. Many credit card companies offer a large percentage of cash back but then reveal that it’s only for a very limited amount of expenses. For example, the American Express True Earnings card claims to give you advertises 3% cash back on gas but that’s only for the first $3000 you spend in a year. And Discover gives you 5% cash back in rotating categories but there’s sometimes a cap as low as $300 on that big cash back. Blackout dates and travel restrictions. You think you’re getting a great deal because you’re earning points towards free flights whenever you use your card. If you’re severely limited in when you can actually cash in then it might not be worth it to get the card. Expiration dates for rewards. If you aren’t going to get the chance to actually use your rewards before they expire then you aren’t benefitting from the rewards credit card. 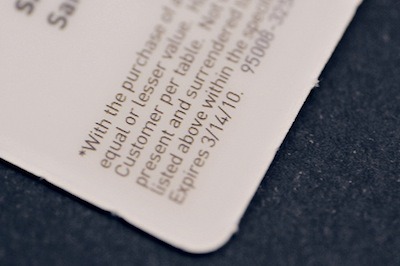 Look for a card that advertises “no expiration” and doesn’t include any fine print in the description. 0% Intro APR. This can be a really great thing but it always comes with fine print. Is it for purchases or balance transfers or both? If it’s for balance transfers, is there a transaction fee for the transfer? How long does the intro period last? What can make the 0% intro APR change? Make sure you read all of the details before assuming that a rewards card is good just because it’s offering rewards plus 0% APR. No annual fee but … Many rewards credit cards really don’t have an annual fee but there are some that add the caveat “for the first year”. For example, the American Express Gold Charge Card has an annual fee of $125 that’s waived for the first year. Be careful about getting a card that’s going to cost you a year from now. Memberships. Some rewards credit cards have no annual fee but require that you get a membership to something. For example, the Costco True Earnings card is only free for Costco members and the PenFed rewards cards require a one-time membership fee to their credit union. Bonus points details. You can earn bonus points on some cards but read the details carefully. You usually have to spend a certain amount of money within a certain span of time. For example, you get 10000 bonus points on the Capital One Venture Rewards but you have to spend $1000 on the card in the first three months (excluding balance transfers and cash advances). If you aren’t going to spend that then the bonuses shouldn’t be an incentive to choose a particular rewards card. Likewise, you might only get double or triple points when you shop through certain merchants. Value of rewards points. Cash back credit cards are generally fairly straightforward. Cards that give you points as rewards aren’t always as clear. You may clearly see that you get 1 point per dollar spent. However, what is a point really worth? To know whether or not you’re getting a good deal, you need to take the time to explore the rewards website and find out how many points it takes to get different rewards. I agree that one has to read the “fine print” before jumping on any reward credit card. I once was under the impression that I was getting points for ordering health products that were equal to dollars. Boy, was I wrong! When I learned the truth, my eagerness to order their product, took a huge fall. this is a great round up of information for people who are looking to weigh the benefits of credit card rewards.